"Then I'm gonna kiss your tummy. Then I'm gonna kiss your pineapple. The B-52's are an American surf-punk-new wave band that hail from...Athens, Georgia? Yea...and they encapsulate all the best parts of the genre that make for a real good time. 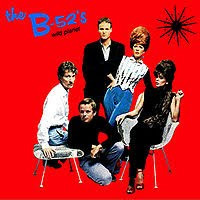 "Wild Planet" (1980) was the B-52's sophomore effort and it doesn't disappoint. Mystery. Camp. Future-Chill. Sexyback. It's all here. This is left-field goodness at its wacky finest. Fred Schneider is the spastic prince that conducts this cacaphony of catchy kool with his nasal talk-sing voice...while great drumming and guitar spank create simple grooves that simply will not go away. And of course, the B-52 babes...Cindy Wilson & Kate Pierson...have adapted well since leaving their own planet...The one I like to refer to as...'Yum-Yum'. Finally, do not mistake silly, for sloppy. The B-52's are skilled. Lost Gem:--> "Strobe Light"...is a lusty...call-&-response...hook-up song with Fred and Cindy doing the honors. The conversation is constantly being interrupted by a delicious frenetic rhythm groove that screams out...URGENT!